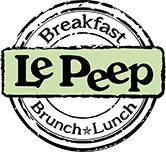 The Le Peep family at the home office is here to help you with any questions, concerns, or ideas you might have. Please do not hesitate to contact us with questions, to provide customer feedback, or learn more about our licensing opportunities. To hear from some of our loyal customers on why they have been coming to us for over 30 years,; visit our Compliments Page to see what our guests are saying to us!